lower left in plate: FROM NATURE& ON STONE BY C.SEVERIN. 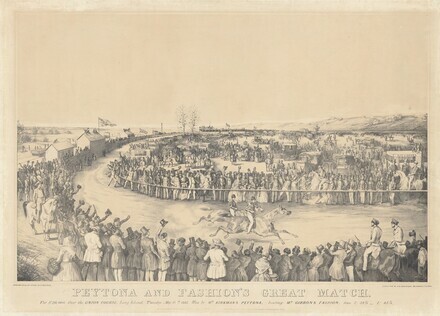 ; across bottom in plate:PEYTONA AND FASHION'S GREAT MATCH. / (1 line inscription); lower center in plate: Entered according to Act of Cong gress in the Year 1845 by H.R. Robinson in the Clerk's Office of the District Court ofthe Southern Di strict of New York. ; lLp//: LITH. & PUB. BY H R. ROBINSON, 142 NASSAU ST.N.YORK.